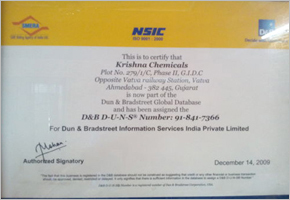 Krishna Chemicals has its location in Ahmedabad, Gujarat (India). We stand as an eminent Manufacturer and Exporter of Fine Chemicals & Drugs, Acetate & Aromatic Chemicals, Formate and various other chemicals, which are used in numerous industries and appreciated for their optimum quality, purity and harmlessness. Presenting our products in an efficient manner, we focus on the modern technology and latest courses of the time. 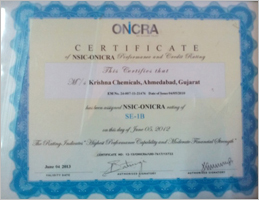 Furthermore, we prioritize total satisfaction of the clients and ensure their convenience in every possible way. Embedded with environmental concerns, our company offer multiple modes of payments. The deft and hard-working team-members contribute in our continual success in the industry. We core aim is to touch the peak of success by offering unparalleled quality of chemicals & drugs that includes Acetate Chemical Compound, Aromatic Chemicals, Sodium Phosphate, Benzoate Chemical and several others. Besides, we are engaged in adapting the changes that occur in the market orientations. Further, we improve our existing product range on regular intervals. Moreover, we have created a solid reputation among the leaders in the market in terms of price competitiveness, quality and delivery. We have a ultra modern infrastructural facility which is supported by advanced manufacturing methodologies,core technology, skilled work-force and cutting-edge production facilities. Further, our team of experts are consists of pharmacists,chemists and other allied employees, who have years of experience in their respective domains. Apart from this, we have the production capacity of around 3600 MTPA. We have a highly spacious warehouse for meeting both small as well as bulk order. Apart from this, our warehouse is well equipped with all the necessary facilities such as optimal moisture and temperature level, for providing a favorable condition to the chemicals.